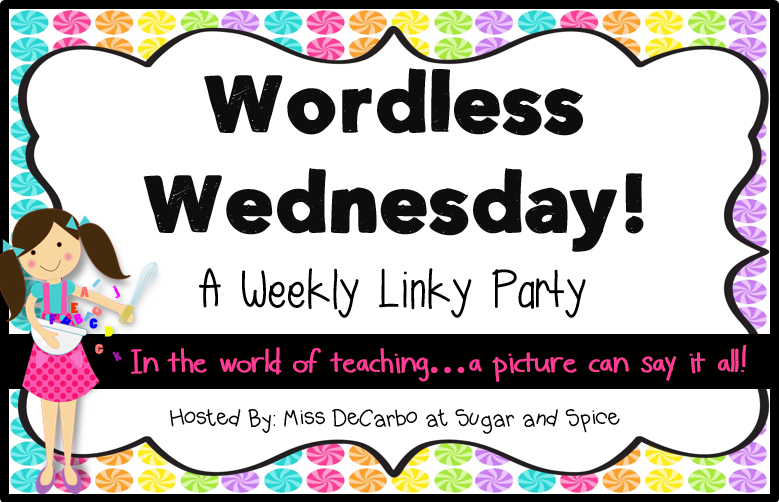 It's Wordless Wednesday! Head on over to Second Grade Sugar and Spice to link up. Here is a pic of how I organize my reading groups. I use the Daily 5 model in my classroom. 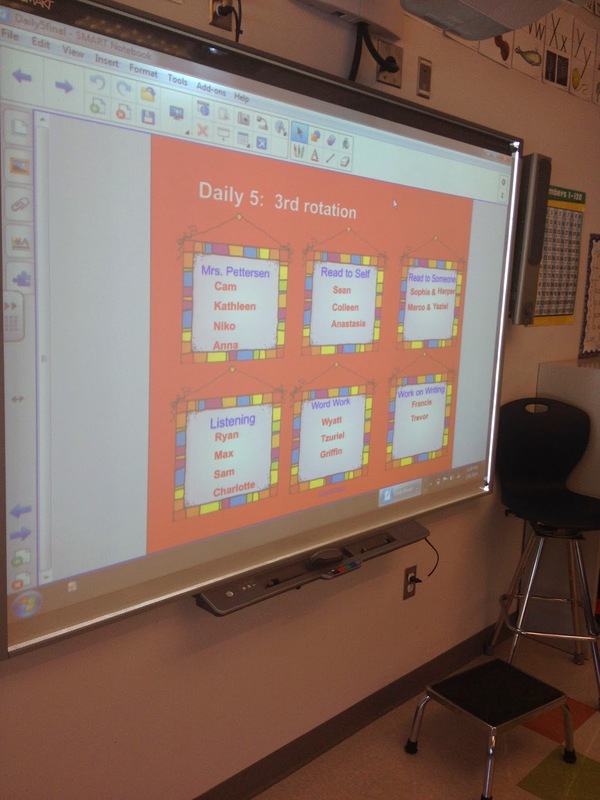 I have my groups organized ahead of time and I display the groups on my SMARTboard so that my students know which rotation of the Daily 5 they are doing. I see about 3 reading groups a day for my one hour literacy block. My district will be shifting to Balanced Literacy in the fall. How do you run and organize your literacy block? I tell the kids who has "teacher time" and everyone else get to make their own Daily Five choices. I love love love the Daily Five. I'm interested to hear about your Balanced Literacy program. Hi Deirdre, I'll keep you posted for sure! It will be hard to let go of Daily 5. I group my kids in two ways. Firstly, based on ability. Once they are in these groups I pull them out into cooperative groups (vertically based). These groups work on contracts that I write at the beginning of a term. They complete these independently, asking their group mates for help when needed, hence the vertical nature. If they get stuck the group leader (the most able student in each group) is able to come and see me for further clarification. They meet with each other 3 times a week for reciprocal reading groups. This frees me up to teach specialised interventions all the time, or test etc. Sounds like I have it easy, but this is DEFINITELY the hard way to go!! So worth it though!! Wow Erin, this sounds awesome! I have a pocket chart hanging on the back wall. Each row on the chart contains the pictures of a group of children and D5 picture cards. I cover one of the D5 cards with a "Meet with Teacher" card when I plan to see a group. This only works because I order the rotation myself. Every group rotates in a unique order, but the kids do not get to choose the order. I modified D5 this way to guarantee I could meet with each group a certain number of times per week - depending on their level and extra times if the kiddos are RTI Level 2 or 3. Hello! I found you through the raffle on Covered in Glitter...I see you live in Mass. - me, too - in Wakefield; teach in Woburn. Nice to find your blog! Hi Susan! Thanks for saying hello! I live in Lexington. So glad you stopped by and said hello! I do reading for only 45min because of the timetable. I have four groups, and they do two activities a day for 7-10min, the rest of the lesson is a focused whole group lesson and share time. I meet with two groups for guided reading each day. My groups are based on reading levels. The other 1 hour-ish of the literacy block is Writer's Workshop. Wow! You are busy! Sounds like a great approach! I am using the Daily 5 this year, and we love it!!! I wish we could continue with Daily 5 but who knows.....maybe we'll like Balanced Literacy just as much!